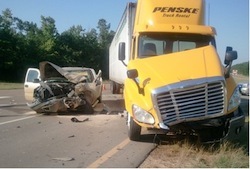 Azusa Truck Accident Personal Injury Lawyers - Over 40 Years of Experience You Can Trust! Seeking a Truck Accident Injury Lawyer in Azusa, California? While no one wants to be injured in a truck accident or other accident in Azusa, if you had a truck, auto, motorcycle, bicycle, pedestrian or any other accident in Azusa, Los Angeles or anywhere else in California, contact our personal injury attorneys and legal team now for a completely FREE CONSULTATION. Our Azusa truck accident lawyers and law firm provide expert personal injury legal services for those injured in a collision or to the family members and loved ones of those killed in a fatal truck accident in Azusa, California. Our Azusa truck accident injury and wrongful death accident lawyers possess more than 40 years of experience in handling claims for truck accident injuries and representing families in wrongful death claims. An Azusa truck accident can be dangerous, traumatizing and fatal for the victims involved. Truck, car and other collisions can cause severe injuries and even death, so it is incredibly important to have an experienced truck accident lawyer on your side. The insurers have their trained adjusters and investigators. You need to even the battle and not be tricked by their often friendly attitude designed to give you a false sense of security then later get hit by their low ball offers when its often too late to do anything about it. We offer a wide range of legal services regarding personal injury law, including but not limited to car, motorcycle, truck, bus, train, bicycle, uninsured motorist (UM) and pedestrian accidents. Our legal consult extends to hit & run and underinsured motorist (UIM) accidents cases, premises liability accidents cases including slip & fall and trip & fall claims, dog bite and dog attack claims, burn injury accidents, wrongful death claims, and other serious and catastrophic personal injury accidents. Azusa is located at the entrance of the San Gabriel Canyon, hence the city’s nickname, The Canyon City. Azusa also is known as the city with everything from A-Z in the USA, thus its real name, "Azusa” or “A-Z-U-S-A”. According to the 2010 U.S. Census, Azusa has a population of more than 46,361. Our more than 40 years of experience in handling personal injury claims, wrongful death claims and other claims in Azusa, Los Angeles and throughout California has bestowed our truck accident & personal injury law offices with the prestigious Personal Injury Law Firm Of The Year 2014 award. Our experienced truck accident lawyers will advise you on all the aspects of personal injuries or wrongful death claims, and offer effective and aggressive representation and administration of justice in the event of a truck accident or other injury claim. We also offer immediate assistance as needed with medical attention, property damage repair and settlement, loan cars, medications, prescriptions, monetary advances, etc. Get in Touch for Free Consultation Right Away! Please get in touch with our Azusa truck accident injury lawyers and our legal team now for a completely FREE CONSULTATION and CASE EVALUATION. We really want to help and not see injured victims who really need help treated unfairly by insurance companies. You also may contact us by emailing us at info@WalchLaw.com! There’s NO fee until you WIN! There are many time deadlines and procedures so please do not delay.